I love Plug-Ins! There, I feel much better now. Since January is the month of the plug-in here at Designing Sound, I thought this was a great opportunity to share one of my new favorites with you. This plug-in does exactly what its name states but it has a twist that I absolutely love. If you have not yet used it then allow me to introduce you to the “Frequency Shifter”. You will find this little gem as part of the AIR bundle standard with Pro Tools 8 and higher. I swim in the dark and mysterious water that is game audio. This means that when I produce a sound effect I am often tasked with creating at least half a dozen variations of it. Why isn’t one sound variation enough you ask? Well if you have ever played a Sci-Fi style video game, then you know how often you are likely to hear the same laser gun being fired. Audible repetition is something we try our best to avoid, lest the illusion of the game world be broken. So in that design spirit, let me show you how easily you can create multiple variations of a laser gun with this plug-in without automating a single parameter. Below is my description of the two primary functions for the plug-in. The Frequency knob allows you to control the amount of Frequency being shifted. I couldn’t find any more information than that. This sounds very similar to modulating pitch with a Low Frequency Oscillator (LFO). The Shifter knob is the real star of this show. It allows you to choose the direction you want the frequency to be shifted. This behavior is basically a frequency arpeggio. I chose the down mode for my example because it somewhat mimics another laser gun creation method I learned some years ago. The method is where you take a synthesized tone and automate a filter cut that starts around 3 kHz at the beginning of the tone and drops to 20 Hz at its end. This plug-ins Shifter knob essentially allows me to skip the automation step and force the frequency to shift down. After inserting the Frequency Shifter onto the handgun track, I could hear that I needed a bit more noise. I created another track and inserted a signal generator set to pink noise. Next came a noise gate set to open with a key input from the main gunfire. Always remember to tame the ADSR of your support layers. In the video you will hear how each pass produces a unique variation. There are in infinite number of ways to continue building on this process, especially when you get creative with your source elements. With some knob fiddling, the Frequency Shifter can generate anything from a simple effect up to one with serious modulation. Now go and turn some knobs! That’s what they are there for. Nice job Tom..! Your example did give a great amount of variation to what would normally be a very stagnant gun shot..! 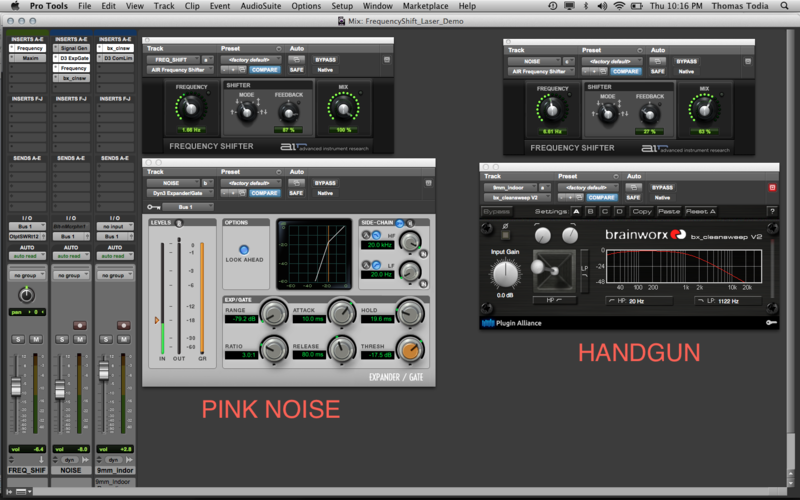 I love the free Brain Works plug-in used in your example too..! I love the fact that you used images and sound examples even including the original dry clip so we could hear the dramatic differences..! Well done..!